Why do I choose to dive in side mount configuration? There are probably as many different reasons divers choose to dive in side mount configuration as there are side mount divers and each individual will have their personal reasons for choosing to use side mount. So why do I choose to dive in side mount configuration? Side mount is by far the most flexible system in all senses of the word. Anywhere there is diving you will find single cylinders, but you may not be able to find doubles in more remote locations. Transporting single cylinders to and from the dive site particularly in remote areas, or if the entrance is difficult to access, is easier than with doubles. Imagine the difficulty of having to crawl or climb through a dry cave or hike 5 miles through dense jungle with a set of doubles. Once in the water the ability to quickly and efficiently remove and replace your tanks, either one at a time or both together, means that you can pass tight or awkward areas easily, opening up parts of the cave or wreck you would not be able to access otherwise. Side mount equipment is lighter and less bulky to travel with which is certainly an advantage in these days of shrinking airline baggage allowances. Back mount puts your tank valves, valve hand wheels, regulator first stages and all the hoses coming from them in the most exposed position they could possibly be in. This creates a huge potential for impact damage of these critical components in an overhead environment such as a wreck or a cave. It also presents a much greater risk of entanglement. If you do experience a problem, you may not immediately be able to identify what or where the problem is as you can't see any of this critical equipment either. You may have to work your way blindly through a valve shutdown sequence, or have to rely on a team mate to assist you or to clear an entanglement for example. Trying to solve the problem is going to be less efficient and more time consuming and some failures will be difficult if not impossible to solve. Breathing from a free flowing regulator by feathering the tank valve, switching out first stages underwater, or breathing directly from the tank valve itself, are not practical solutions in back mount but can all be done easily and comfortably in side mount. Although extremely unlikely, catastrophic gas failures are possible. True gas redundancy is only possible with independent tanks so back mount divers equipped with a manifold must either dive as a team or carry a safety bottle to confer sufficient safety in the event of a catastrophic failure. Side mount divers have true redundancy and are completely self sufficient. In the event of a catastrophic failure only half of the gas would be lost and, assuming proper gas planning, there would be sufficient remaining gas to exit safely without having to rely on a team member or safety tanks. When you actually think about it, you really have to wonder who thought it was a good idea to put the tanks on the diver's back in the first place. The best place for your tank valves and regulator first stages is in your armpits where they are protected, where you can see them and where you can reach them easily! For me side mount is the most natural diving configuration and is the most comfortable and enjoyable to dive. I love to free dive and the sense of complete freedom in all three dimensions is really exhilarating. I don't have gills so cannot stay down as long as I would wish, hence the need for SCUBA. Unfortunately, as soon as you have a steel back plate and set of doubles locking your body rigidly in place you lose a great deal of that freedom. Side mount returns that sense of freedom as you are able to move your whole body and twist and turn so that diving can become a graceful and fluid dance in a weightless three dimensional world. Old injuries are also catching up with me. For me manipulating back mount valves is awkward and painful, whereas in side mount it is no problem at all. Often when I am exploring, the most difficult and dangerous part of the entire experience is getting both my equipment and me all to the water in one piece. Carrying tanks over uneven trails or climbing down into difficult cave entrances is challenging and potentially dangerous, especially because of a knee injury. The last thing you want is to fall and seriously injure yourself in a remote location. Again, single side mount tanks are easier to deal with than a set of doubles. Once you have your equipment at the dive site, being able to gear up actually in the water at the start of the dive, and then take everything back off again still in the water while essentially weightless before climbing out at the end, is also often easier and more comfortable than having to make an entry or exit carrying all of your gear including tanks. As we are all aware, post dive exertion is one of the biggest contributors to decompression sickness. Ultimately the more comfortable you are the safer you are and the more you will enjoy both the dive and the whole diving experience. Getting proper training for all levels of diving is extremely important. The more advanced the level the more important it becomes. Finding a knowledgeable experienced side mount Instructor will be a huge advantage for the diver wishing to progress in a safe, efficient manner. Being a good side mount diver requires a great deal more thought and attention than just hanging two tanks off of the side of your body. A poorly configured setup will make everything much harder. Choosing the right equipment and then having it configured correctly is important in becoming comfortable as soon as possible in side mount. But equipment is only half the battle. When you completely change your equipment configuration from back mount to side mount a lot of other things are going to change as well and a whole new skill set is going to have to be learned and practiced. However, learning exactly what those skills are and how to perform them correctly is critical as practice makes permanent and only perfect practice makes perfect! Side mount is here to stay and I really see it getting more and more popular. There will be more side mount specific equipment available. Equipment configuration is going to become far more standardized as are skills sets and procedures. Side mount rebreather systems are going to become more common. 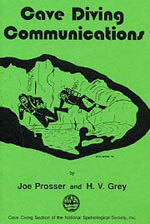 This is a must have book for every cave diver. It includes illustrations of the full repertoire of standard hand signals, as well as touch, torch and line signals.